BANSKO, Bulgaria (AP) — Alexis Pinturault added the season-long World Cup title in Alpine combined Friday to the world championship title he won 11 days ago. The Frenchman won the discipline's season-ending race after his main rival, Marco Schwarz of Austria, picked up an injury in the super-G portion and was forced to skip the slalom. "I am really happy but also a little bit disappointed because Marco got injured," Pinturault said. "I wanted to have a great fight. This is bad news. It is a really happy end for me but I think also about Marco." Schwarz, who was leading the combined standings after winning the only previous race in Wengen last month, hurt his left knee after landing a jump shortly before the super-G finish. The Austrian ski team said Schwarz would travel back to Austria for medical checks later Friday. The runner-up in the standings, Victor Muffat-Jeandet of France, didn't finish his slalom run and also failed to score points. Pinturault acknowledged he changed his tactics after Schwarz went out and other rivals failed to put pressure on him. "After the super-G I knew there were no real contenders," he said. "I had to control my skiing. The main point was to finish my (slalom) run." 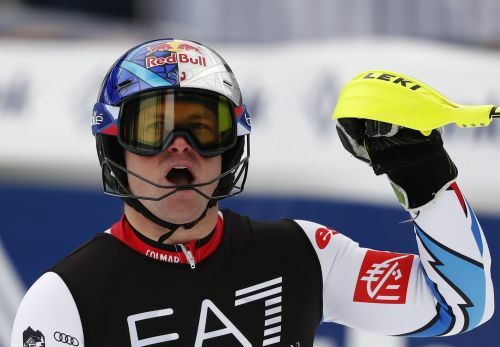 Pinturault, the 2018 Olympic silver medalist, has now won five season titles in Alpine combined, matching the World Cup record set by Kjetil Andre Aamodt of Norway 17 years ago. The Frenchman is now also the only male skier to win at least one combined event in seven consecutive World Cup seasons. Pinturault won Friday's race by 0.68 seconds. Seven-time overall champion Marcel Hirscher, who made a rare appearance in a combined event, was second in the only discipline in which he has competed before but not won a World Cup race. The Austrian, however, won gold in Alpine combined at last year's Olympics. The result means that Hirscher lost only 20 points from his massive lead over second-place Pinturault in the overall standings. The Austrian is now 460 points clear. Stefan Hadalin of Slovenia was 0.69 seconds behind in third, with the rest of the field more than a second behind. Pinturault trailed Mauro Caviezel of Switzerland by 0.16 seconds and Vincent Kriechmayr of Austria by 0.06 after the super-G run, but they dropped to sixth and 11th, respectively, after the slalom. Making his World Cup debut in a combined event, Henrik Kristoffersen of Norway finished 2.64 seconds off the pace. A super-G on the same hill is scheduled for Saturday.